Reflections from Portland's Japanese Garden. Photo by Wayne Senville. Talking about the explosive growth in bike facilities across Portland yesterday, reminds me of something else that's also seen explosive growth. I'm referring to food carts. But that's not to deny that food carts have seen an amazing renaissance across the country, as planner Beth Humstone reported for us last year in "Eating on the Go: Mobile Food Trucks." In Portland, food carts have really sizzled. Head downtown and you'll find an entire city block (home to a parking lot) completely lined by food carts. What a great way to hide a large surface parking lot! But there are also plenty of smaller "pods" of food trucks throughout the city. 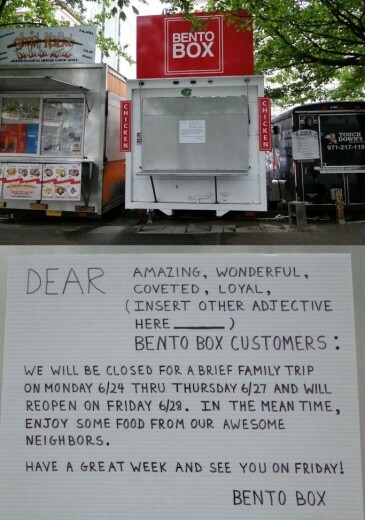 All told, there are now some 500 food carts in Portland. 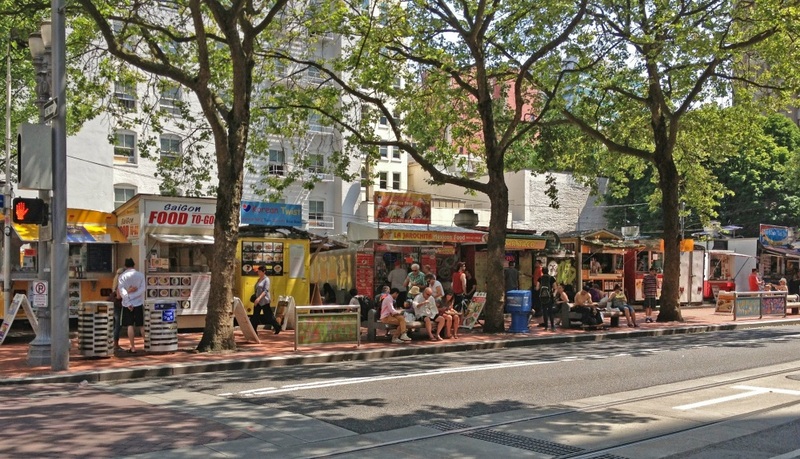 The food cart explosion is part of the creative, entrepreneurial dynamism that's fueling Portland today. What's perhaps most amazing is that the city government, instead of throwing up barriers, has been listening to the needs of food cart owners. When food carts are located on private property in Portland, as long as they keep their wheels on, they're regulated as commercial vehicles -- not as buildings. When located in the public right-of-way, city permits are required. 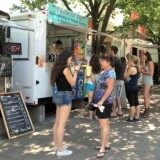 Food carts are also subject to county food preparation regulations. 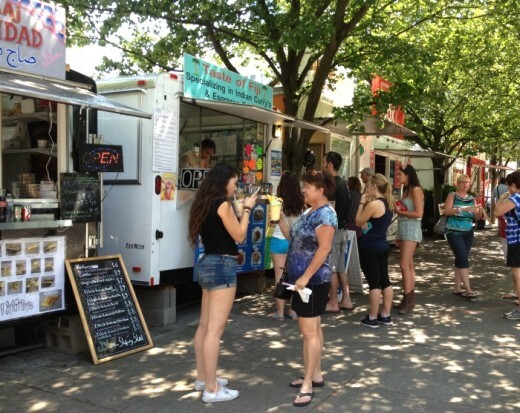 See the City of Portland Bureau of Planning and Sustainability's Food Cart page. "Food carts have signiﬁcant community beneﬁts to neighborhood livability by fostering social interactions, walkability, and by providing interim uses for vacant parcels. Additionally, carts provide good employment opportunities for immigrants and low-income individuals to begin their own businesses, although there are significant barriers to continued stability and success." The report's bottom line: "The City’s support of the food cart industry can advance the key public values ... and benefit all Portlanders." 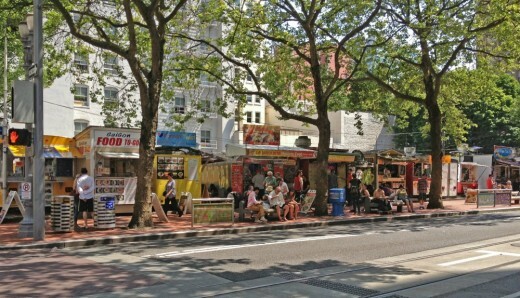 For me, the sights, sounds, and colors of the many food carts -- plus the mix of scents wafting from them -- add to the vibrancy of Portland. And that's not to mention getting some good tasting, affordable meals from a wide variety of cuisines. "People who live there have a right and expectation to be involved with the future of their own community; it's not just what planners or developers want." That's what Portland Mayor Charlie Hales told us at the opening session of the International Making Cities Livable conference -- and it stuck with me during the next ten days I spent in Portland. Portland has a history of strong neighborhood activism. Professor Carl Abbott writes about this in his excellent book, Greater Portland: Urban Life and Landscape in the Pacific Northwest, discussing how neighborhoods were strengthened in the early 1970s with the formation of an "office of neighborhood associations" in City Hall. As Abbott comments, "neighborhood associations remain important actors on local issues. They are independent bodies that receive city support staff and communication funds." With formal recognition, he notes, they have a "seat at bureau and city council discussions of issues with neighborhood impact." Painting residential intersections brings neighbors together in Portland -- and it's fun for kids. photo by City Repair; Flickr creative commons. 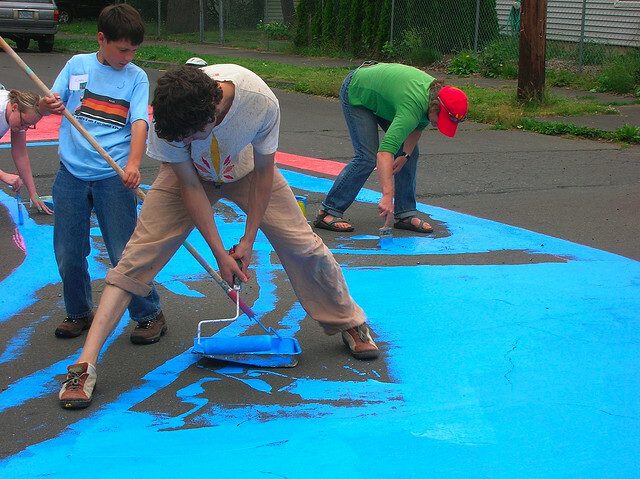 I also highlighted how the nonprofit City Repair organization has worked with residents across the city to strengthen their neighborhoods -- sometimes by painting residential intersections. But there's also a closer to home example, so to speak, that I want to mention. Long-time Planning Commissioners Journal (and now PlannersWeb) readers have enjoyed dozens of articles by Elaine Cogan. 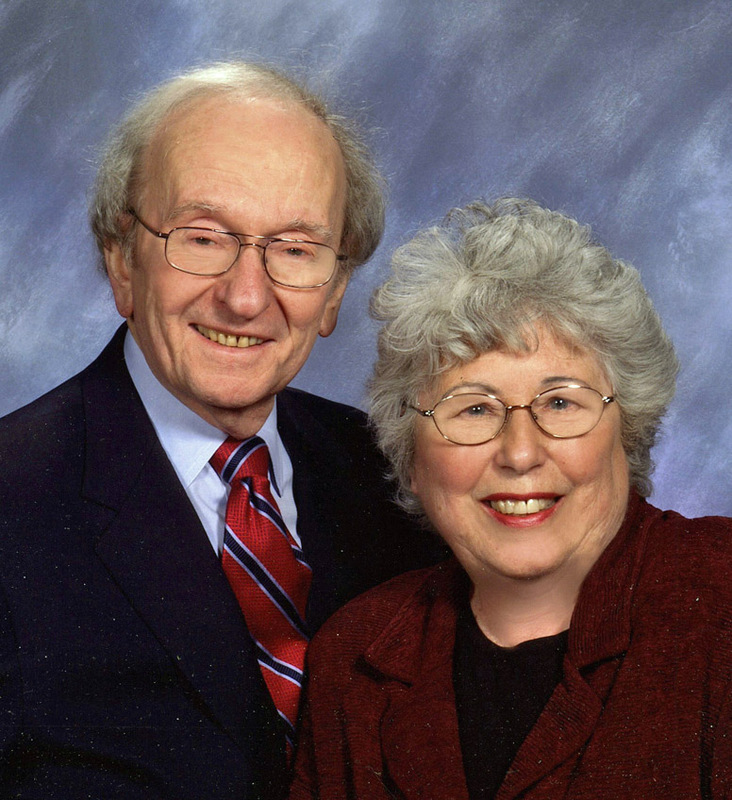 In case you weren't aware, Elaine and her husband Arnold Cogan were founding principals of Cogan Owens and Cogan, one of the Pacific Northwest's top land use planning firms. Arnold played a key role in the formulation of Oregon's pioneering land use laws. He was Oregon’s first planning coordinator under Governor Tom McCall, and first director of the state Department of Land Conservation and Development. 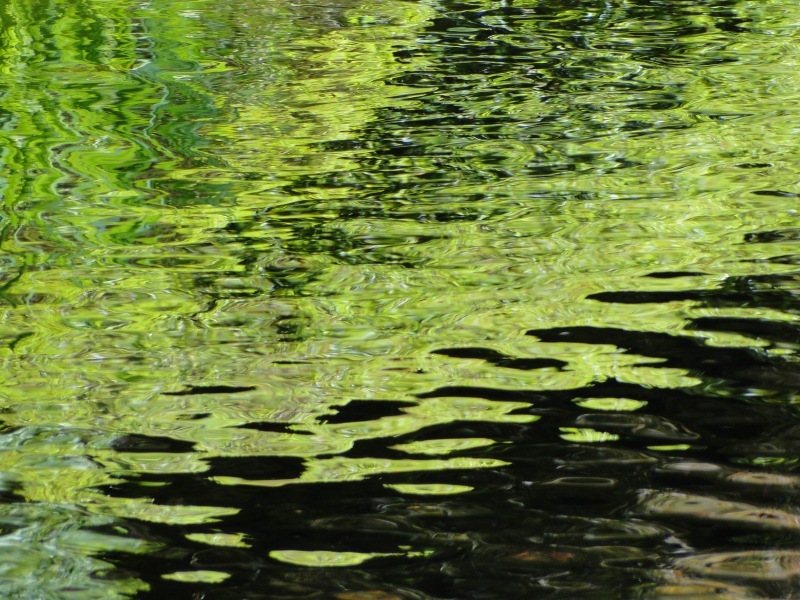 Arnold has worked on a broad range of planning studies and projects in Oregon and elsewhere. 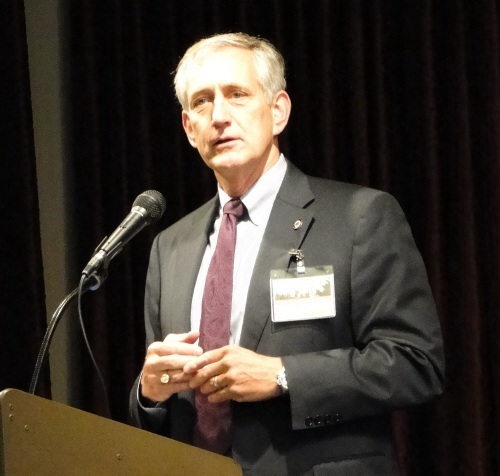 (He was also recently honored by being a keynote speaker at the Oregon APA chapter's "40th anniversary celebration" of enactment of Senate Bill 100, Oregon’s landmark land use law). Elaine -- who sometimes has to remind me that she's not a planner -- has focused her career on public involvement and communications strategies. She's managed, and moderated, countless public meetings -- drawing on the breadth of her experience for the suggestions she's provided to our readers. It's in large measure due to the talents of Elaine, Arnold, and others like them, that Portland has embraced community involvement as something planners and local officials should welcome and seek to encourage, not as something to just get through because it has to be done. "We are a state accustomed to involving the public in most decisions and by reference, Portland, our largest city, is its flag-bearer. ... Genuine engagement with the public requires commitment, perseverance, time and money. Each is very important. First of all, it is commitment to the process, not the end product that gains the confidence of the public and encourages them to participate. It takes considerable time and effort and is not inexpensive to ferret out all the interests who want to or should be engaged and give them the means to have their say, often influencing the ultimate result." 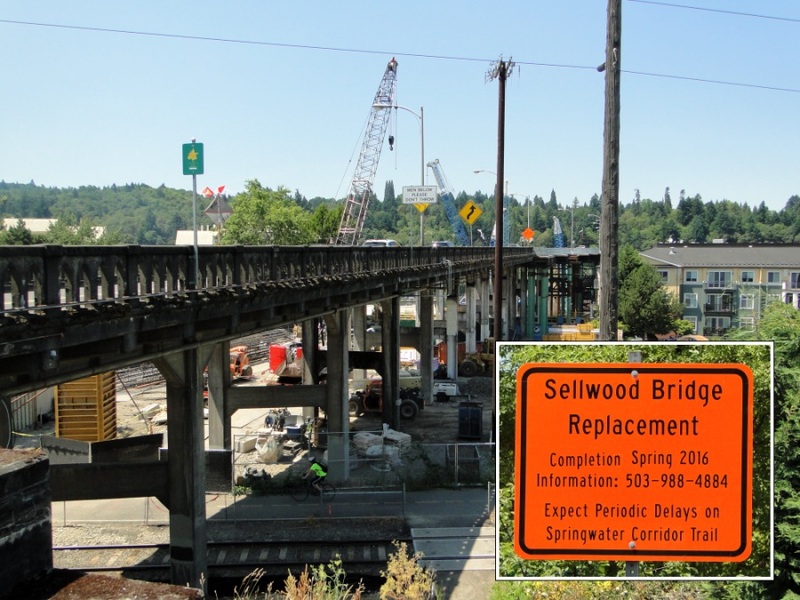 thousands of daily commuters anxious for a solution as soon as possible. Elaine Cogan designed and facilitated meetings of the Sellwood Bridge project's Community Task Force, which met 23 times throughout the course of the planning effort related to reconstruction of this major Willamette River crossing in Portland. Kids, What's the Matter With Kids Today! Can Intersections Lead to Stronger Neighborhoods? Hey, Where's the Ski Slope? 10. But Does Portland Work For Everyone? Retrofitting Dead Malls / Health Rankings / Do Your Neighbors Shape Your Behavior?